LEPTON package is the latest stable release for productive use. Once installed it gives you access to all addons, even to special commercial addons that give your websites much more flexibiltity, chances and security. 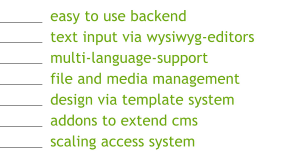 LEPTON has got ( nearly ) no limitations in cms functionality. If you want to check if LEPTON is running on your server or webspace there is no need to upload the whole package. Please download the server precheck file, load the unzipped file to your webspace via ftp, call it in your browser and you are done. Server precheck file is very small in size, uploaded quickly and may save you a lot of time.